Wow, it's been a while since I last posted on the blog. She is such a sweet and smiley little thing, I really LOVE spending time with her. No wonder the days have gone by at such speed, and my lack of blogging has ocured. I've also been busy giving my time to Luca school (really, an excuse to spend some more time with him), by filming and editing little videos for their end of term "showing"... which has been so lovely. Lovely to see your child really enjoying school and confidently moving through and within a little gang of cheeky boys (and girls). So, on the subject of PLAYING, I found this idea on a blog and thought it looked such fun! I played it for hours and hours with my great Aunt Maia. She was the best, as she always led me to believe that I was winning, though in fact, she was blatantly letting me win. In Italian, we used to call it Memory (I know, odd, considering that it's an English word), but "Pairs" is a perfect name. Hence, I was overjoyed to find the idea of making the game out of scraps of fabric. What a cool little project. Easy to make, though it takes some ironing savvy in order to make sure the underside "clues" don't poke out and so, kill the "skill" of the game. I found the tutorial for this on the blog Me Sew Crazy. 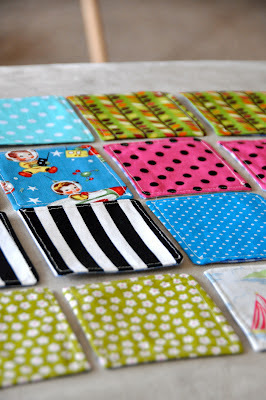 Various scraps of fabric (I made 12 pairs - so 24 "cards" in total), that you will cut into 10cm squares - you need two squares of each colour/pattern. 24 squares of the same pattern/colour. 24 squares of Batting (to firm up the "cards"). Sew them together, right sides facing and batting on top, leaving a little opening on one side. Turn the squares inside out and press them, making sure the corners are well pushed out. Finish off by sewing a border all the around the square, about 1/2cm from the edge.